What do you reckon? Good, bad or cheesefest? Thanks to Danny Dickblood for the tip. 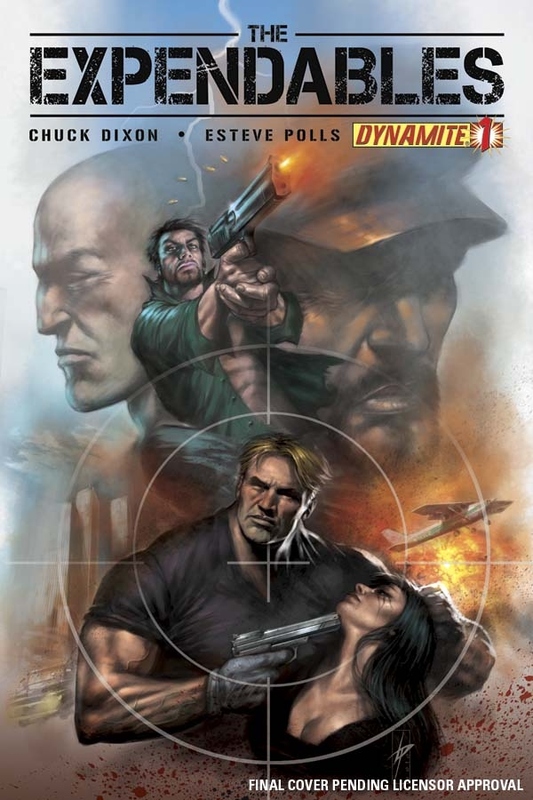 Newsarama had the art and chatted to writer Chuck Dixon about the comic book. 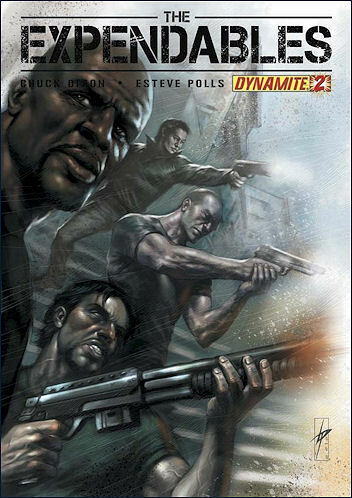 The Dynamite 4 issue series starts in May. Who will win? Human or Computer generated actors? We know that Stallone, Bruce Willis and Schwarzenegger had been filming their first scene with them all together during the filming of The Expendables. Now Sheryl, Stallone’s publicist, posted more details on her blog and it sounded like a fine old time was had by all. It sounds as if Arnie will not be playing the Governer of California as previously reported. He is playing a character called Trench and the trio’s scene sets up the whole film. She also says photos will follow. She then goes on to clear up the whole Rocky 7 rumour that I posted a while back. Looks as if it was from an old interview about Rocky Balboa. Also the interview that has been running with Sly talking about doing another Rocky – hello people – that was done 3 years ago!!!!!!!!!!!!!!! it is not a new interview and Sly has no intention of doing another Rocky – Rocky Balboa was the perfect bookend to the original Rocky – nothing left to say. I personally am pushing Sly to do Poe – but that will have to wait until he does the next movie – whatever that may be. Just when you thought it was safe to enter the ring…boxing ring. Honestly, some people can be so smutty. Sylvester Stallone is almost finished on The Expendables (cameras are currently rolling on Stallone’s scene with Schwarzenegger and Bruce Willis. How cool is that!) and is then going back to Rambo V: The Savage Hunt and fighting some kind of genetic beastie. Not to let a good film series rest (and also bringing us closer to the future vision laid out in Airplane or Hot Shots) Stallone has mentioned that he will be going back to Rocky Balboa – despite the last one supposedly being the last one! Teensay revealed that the 63-year-old is preparing to be criticised by movie experts and loved ones when he works on his next blockbuster. He said: “I know I’ll probably make a fool of myself if I make another ‘Rocky’ film after turning 60. My Wife and I are big Rocky fans. I think the first one is especially good, but all have their moments (some are really bad moments) and are very enjoyable. Rocky Balboa or Rocky 6 was a great way to bring the character back, but also gave him some closure. He came back for one last fight and did the business. That was the point of the film. Therefore, I find it a little odd that Stallone is going to go back to the character one more time. I can’t see the character having another fight, but without that you don’t have a Rocky film. Anyone have any ideas how another Rocky film could work? 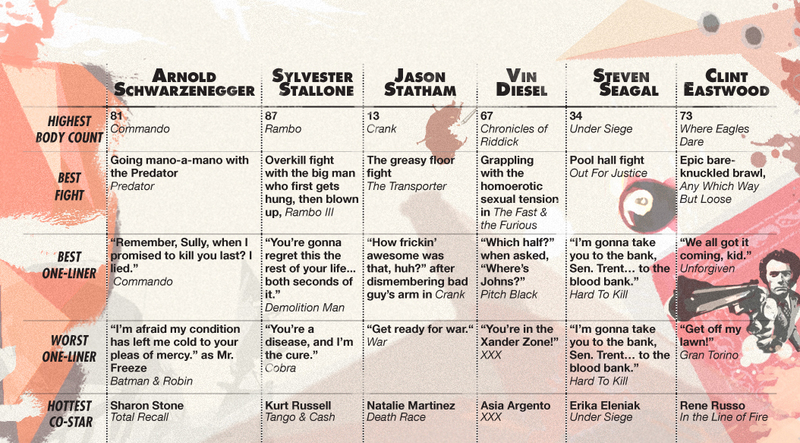 Do you think Stallone is being a bit silly doing another or should he go full steam ahead? Judge Dredd – Could Gerard Butler be heading to Mega City 1? I recently posted the fact that the comic book artist Jock (The Losers) was still working on the concept art for the new Judge Dredd film. Alex Garland (The Beach) has written the script and things are slowly moving along. As we all know Stallone played him in the previous version (it had a great opening 10 minutes and then it just got ugly). The big question for the new one is who will they get to play Judge Dredd? I could see someone like Bruce Campbell (he has the chin), Ron Perlman (he doesn’t mind covering his face and we all know Dredd never takes his helmet off – well not on screen anyway), Thomas Jane, Billy Zane or Jason Statham. I have received a few emails that suggest Gerard Butler (Gamer, 300, Law Abiding Citizen) is interested in the role and has been in talks. Now I have looked around the web for confirmation of this, but so far I cannot find anything else. However, the emails I have received have all come from different unrelated sources, a couple of whom are usually spot on. For the moment mark this one down as a great big rumour though – it is still early days and I personally don’t think they are as far along as casting. If anyone happens to know Gerard could you ask him if this is true. I will keep digging and let you know if I find anything more. Do you think Gerard Butler would make a good Judge Dredd? If not him who else could it be? Be sure to check out all the other polls – Vote on who should be Captain America, Catwoman, Spider-Man. What did you think of Avatar? What’s your favourite John Carpenter film? What’s Nic Cage’s worst film and many more. Here is a bootleg of the teaser trailer for The Expendables that was shown at Venice Film Festival 2009. Due out on 20th August 2010. It is quite hard to tell how good or bad the film is going to be as it is difficult to make out what exactly is going on in the bootleg. I just want it to be at least half as good as my mind tells me it should be. Director and star Sylvester Stallone is joined by Forest Whitaker, Eric Roberts, Jason Statham, Jet Li, Randy Couture, Dolph Lungdren, Mickey Rourke, Charisma Carpenter, Steve Austin, Arnold Scwarzenegger and Bruce Willis. Thanks to Ian for providing the link to a working version of the bootleg.